Weather Mate utilizes the data contributed by more than 33,000 stations to add to the specificity of weather reports. Hence, accurate, reliable and hyper-local information about the current atmospheric conditions and predictions about future weather can be obtained by virtue of this feature. 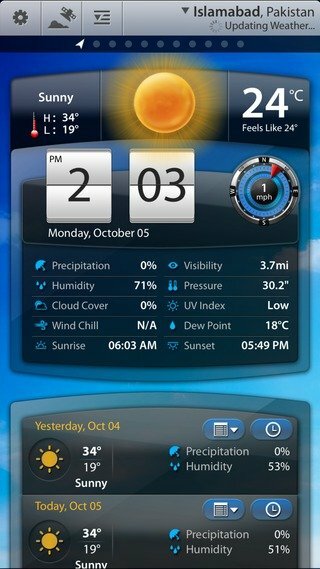 In order to access Weather Stations feature in Weather Mate, just tap on its icon in the top right corner of the app’s home screen. 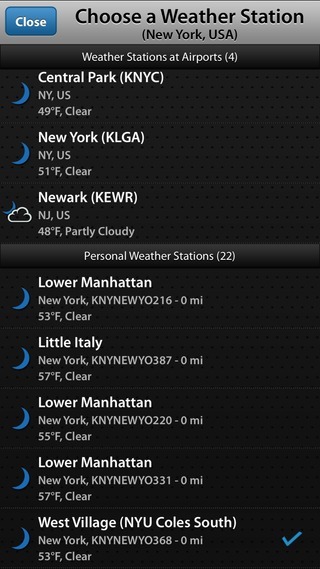 This shows a pop-up containing a list of the weather stations at airport as well as another list of personal weather stations near your current location. High-end weather observing instruments are installed on airports and are used for forecasting weather and monitoring aviation and meteorological conditions. Based on the data disseminated by these stations, weather observations and updates reach the majority of the common public. However, depending on the location of the airports, a common weather observer might be present at either a near or distant place. So there are likely to be variations in accuracy of weather forecasts based on the distance between the locations of the two. Professional-grade personal weather stations have been set up by weather enthusiasts in a number of neighborhoods all throughout the US. The stations are home to a number of instruments designed to determine certain atmospheric variables at any point in time and hence provide the accurate localized climate predictions. Therefore, if you wish to know about the weather conditions of your locality, more accurate information can be retrieved from the weather station installed in your nearby neighborhood. Do you want to get localized weather updates? Download our app Weather Mate that provides hyper-local weather forecasts.